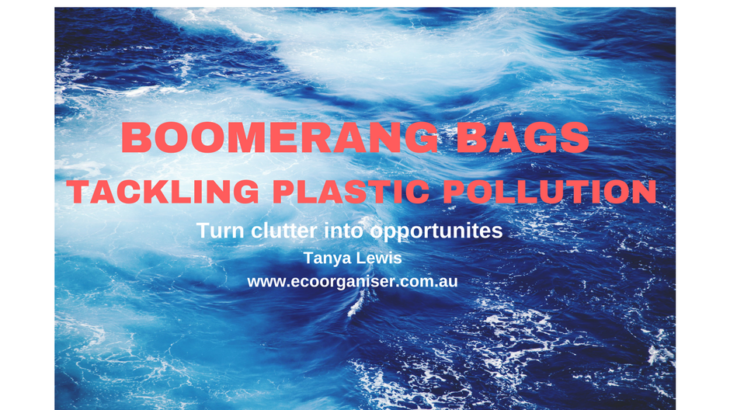 Boomerang Bags turns clutter into opportunities for others, to tackle plastic pollution. It is wonderful to see grassroots groups such as Boomerang Bags take the lead to tackle plastic pollution. Boomerang Bags is a community driven movement tackling plastic pollution at its source. Volunteers from all walks of life get together to make reuseable ‘boomerang bags’ using recycled materials, as a means to provide a sustainable alternative to plastic bags. The bags are given away to friends, family, colleagues, bagless strangers and so on, as a plastic bag alternative that can be used and reused or passed on to others in need. The bags create a platform to start conversations, make friends, up-cycle materials and work towards shifting society’s throw away mentality to a more sustainable revolution of re-use – one community, needle and thread at a time! With a philosophy like this Eco Organiser® was keen to interview our local Boomerang Bag organiser to find out how our unwanted fabric, which is cluttering our homes, can help reduce plastic pollution on our beautiful planet. I started by asking Gwen why she became involved in Boomerang Bags? “Personally, I took on the Plastic Free July challenge, aiming to go 100% plastic free that month. I started by practicing in June, giving me time to prepare for my challenge, however, the first time I stood in the supermarket the size of the challenge really sank in – 99% of the products are wrapped in plastic. I went home with just a few goods and had to totally rethink my shopping. Working as a professional organizer, I once decluttered a garage and uncovered 2000kg of beautiful fabric! If your cupboards are bulging with fabric and thread that you haven’t used in years and know deep down you will need use them, here’s your opportunity to declutter and turn clutter into opportunities for others, just think how many dolphins we can save from digesting plastic bags, simply from decluttering our cupboards. Note: BB’s aim is to divert fabric from landfill, BB ask that you do not purchase especially for the BB project. Ticking many of The 10R’s©, nothing is wasted, fabric sewing scraps are used as filling in an ottoman to achieve zero-waste. This project has inspired people to repurpose clothing, create yoga bags, hankies, dog bedding, etc. The beauty of Boomerang Bags is the high level of community engagement, they connect with children through bag decorating and depending on the age also cutting and sewing. If sewing is not your thing there are plenty of roles to go around, Boomerang Bags need people to help cut, iron, sew, organise, help at stalls & events etc. The Waste Coach #plastic, #pollution, #waronwaste, clutter, reduce, reduce carbon footprint, refuse, repurpose, rethink, reuse, reward, The10R's, waste. permalink.